Always Open to the PUBLIC! We'll be opening on SATURDAY, SEPTEMBER 9, 2017 for the 2017 - 2018 Michigan Pheasant Preserve Hunting Season. This year marks be our 21st. season of pheasant hunting at The Ringneck Ranch LLC. The years have gone by in the blink of an eye, and we can't wait to get it going again. The RNR opener is practically pounding the door down, and we are so ready for it to get started! TOnce August starts to fizzle out and Labor Day is looming around the corner we're ready to start burning it up again. It's the same every year, and we can hardly wait for it to break loose and see upland bird hunters with their dogs coming up the lane during those early autumn days. You can't imagine a prettier picture than a dog flushing or pointing a rooster pheasant, or a hunters true aim and the dog, all proud, bringing the bird back to hand. All with a majestic backdrop of every color on autumns pallet. Oh! Did I mention the pheasants and how incredible they look when they take flight? The sun's shining off of their backs and their tail feathers are waving, looking like they're about a mile long when they come busting up out of the cover. After you've harvested your pheasants we'll be waiting to be the first to hear the story of your hunt. Maybe you'll even share tales of other memorable hunts. The "Ranch" is open to the public by reservation, with no memberships or gunning fees. Just pack it up and come out. 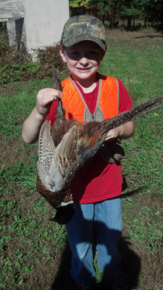 We want to show you Michigan's best upland pheasant hunting. We stock beautifully feathered, healthy and strong flying pheasants that are fed a special diet while they're kept in large flight pens with limited exposure to dogs and people. When you hunt at The Ringneck Ranch LLC you're going to be hunting in some of the absolute best cover available in Michigan. We cultivate and re-plant every field annually with sorghum; corn, and more. The woodlots and fence rows have been left intact for generations to insure incredible hunting opportunities for shooters of every ability. You'll be hunting fields, woodlots and along the Kalamazoo river bottom. It's right here and we'd love to show it to you and your guests. In addition to hosting half or full day walk-up hunts, scroll on down for all you need to know about: "Big Daddy Ron's European Style Hunts", the mega rock the rooster event where you, your family and friends are the big stars. Now that you're here, take a few minutes and explore our website for package pricing and answers to some of your questions. Check out the pictures at the Shooters Gallery and remember to submit a request form so we can personally answer any questions you might have or to get that hunt date set up. We can't wait to have you out to enjoy some major running and gunning Ringneck Ranch style! State of Michigan no longer requires shooters to have a hunting license while hunting at The Ringneck Ranch LLC. This applies to both state and non-state residents. We're all about showing you a incredibly great time hunting for beautiful, cunning and great tasting Ringneck Pheasant in southern Michigan! As always, The Ringneck Ranch LLC welcomes all the terrific hunters that come here to hunt pheasant. Pheasant hunters look forward to their Ringneck Ranch hunts with co-workers, family and friends; all of them great outdoorsmen, women and young hunters who are working to keep Michigan's hunting heritage alive and well. We've hosted some spectacular hunts at the Ranch over the years. Countless shooters come out to bust those cagey ringnecks with great success . It doesn't matter whether you come out to spend a few hours field hunting, or if you're here to obliterate massive numbers of those crazy pheasants as they come burning out of the tower during one of ", it's always another great day of pheasant hunting at The Ringneck Ranch LLC. We can't even begin to tell you how much we enjoy having all of you out, and how much we appreciate the time you spend with us. Whether your hunt party consists of you, or you and 29 of your closest hunting buddies, we're going to bend over backwards to make your time hunting with us unforgettable. When you get here we'll meet in the "Shot-Lodge". Bring your gear in, grab some fresh coffee and get registered. While you're busy gearing up to head out into the field Ron's going to be a step ahead of you planting your pheasants per your directions. Don't think you'll have some oh-so-easy hunting, or that those birds are going to pop right up so you can take a pot-shot. Not these ringnecks. These birds are raised in extra large flight pens with heavy cover and minimal exposure to humans or dogs. Our ringnecks are strong flyers, and as wary and wily as any pheasant you'll hunt in Idaho, Iowa, Kansas or the Dakota's. You're going to have some high-times shooting. Feel free to plug in your crock-pots; use the range, the fridge and just about anything else you need to pull a snack, lunch or dinner together. Give us a heads-up if you want to do a little grilling. We'll have the grill ready and waiting. If you want to skip hauling food we'll be glad to pull a lunch together for your group with advance notice. Give us a call (517/524-8294), or send an e-mail to: ringneckranch@aol.com so we can show you just how The Ringneck Ranch LLC has it happening when it comes to hunting pheasants. If you 're looking for a great deal on pheasants and shooting that's a little more intense and action packed than a field hunt but really want to keep traditional field hunt alive you need to book into one of "Big Daddy Ron's European Hunts". That's right, this is it! You'll have to get up early to make the morning drive, but you won't be missing that hour or two of sleep for long. Coffee and fresh baked that morning pastries will be waiting in the Shot-Lodge, and once the caffine and sugar start to shake you awake you'll still have a few minutes to catch up with old and new friends and to get your gear; guns and shells together before the safety meeting. Then it's a short drive to the tower field and a quick walk to one of fifteen shooting stations and some incredible shooting action. You're going to have ten wiley pheasants per shooter pitched out of the tower in rounds of ten birds each for up to 30 shooters who will rotate to the next station after each round. While you're out in the firestorm things are happening at the Shot-Lodge as we pull together a spectacular lunch. You'll be working up a massive appetite for juicy and tender, thick-cut New York Strip Steaks, hot off the grill, served with salad, baked potato, rolls, beverage and seasonal desserts. You're going to eat a lot; maybe too much; but don't worry, you'll be burning that and more off in the afternoon. There won't be any stretching out for a little afternoon snooze because after lunch it's back to the fields for a walk-up to kick up those birds that made it through the circle of fire that morning. It's the best of the best: a full day of running and gunning the entire Ringneck Ranch property for the days participants of Big Daddy Ron's European Hunt. When the days over you'll be loaded down with your own fresh, plucked clean and processed pheasants. We've included everything except a dog, your hunting clothes, shoes, gun and ammo. All you have to do is show up and shoot! You're going to have some hunting fun. When you contact us remember to ask about the cash discount for the groups coordinator who pulls it all together and makes a European Tower Hunt happen. Having a superior hunt always comes back to the same three elements. You need healthy; hard flying game birds, great field cover for those birds to hunker down in while they wait for you and that great flushing or pointing dog to roust them out and bust them into flight. Did I mention the excitement of bringing your gun up to your shoulder; aiming, firing and watching that cockbird careen to the ground? And then there's the pure beauty of watching that incredible pointing or flushing dog make a perfect retrieve and drop it right into your hand, all proud of himself and the great job he just did for you.The three magic elements of a great hunt: a dog that lives for the hunt; healthy, hard flying gamebirds and exceptional cover. Anyone that hunts at The Ringneck Ranch LLC will tell you that we have those three magic elements all available to you in one place all at the same time. Birds here are treated to a special diet for maximum performance and conditioning and are housed in areas with plenty of room for them to hone their flight skills. We work hard to provide you not only with great service: the best birds; and a top notch facility, but also with superior cover in comparison to many other preserves. The cover here is excellent in the early fall, but sorghum seems to come into it's own after it's been hit by a few heavy frosts, two or three wet snowfalls and a little freezing rain. One tip to remember is to always look beyond what's right in front of and around you. Remember to work those fence rows, wooded lanes, plots of corn and hit the brushy areas that are included in your designated hunting area. Chances are whether you're hunting with your own dog, or one of ours you're going to find an extra bird or two hiding out in some of the most unlikely places.